Kevin Bacon is the face of a new infomercial encouraging people to shop local this holiday season -- and donate to charity in the process. "Six Degrees of Kevin Bacon" has become pop-culture shorthand for connectivity. And this holiday season, small businesses are using the concept to encourage shoppers to ditch the big-box stores -- and donate to their favorite charities in the process. For the past two years, small businesses across the country have participated in "Shift Your Shopping" during the holiday season, a campaign encouraging people to shop local. This year, during the four day post-Thanksgiving shopping blitz (Saturday to Tuesday), more than 200 small businesses are taking it one step further. They're partnering with Causetown to donate a portion of their sales to charity and calling it Shift Your Shopping for Good. And that's where Kevin Bacon comes in. 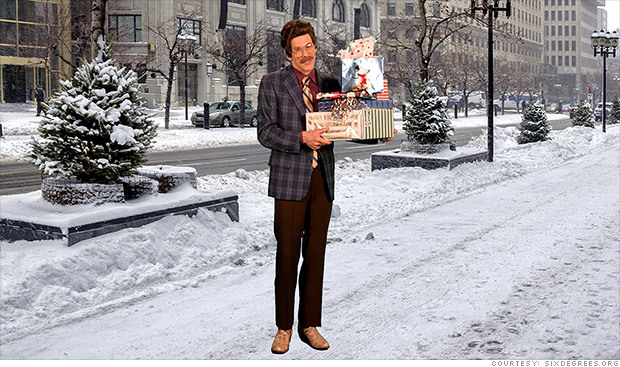 The actor takes the lead in Shift Your Shopping's schmaltzy PSA, donning a fake mustache and Pittsburgh Dad glasses to spoof the six degrees concept. Placing the well-known actor at the center of the campaign is an attention grabber -- one organizers hope will encourage more people to shop local. The movement hasn't been blessed with much star power, says Joe Grafton, chair of the Shift Your Shopping steering committee, but he hopes Bacon's involvement will prompt millions to reconsider how they spend their money this holiday season -- and think about what those choices mean for their communities. Buy-local campaigns can be a powerful tool. Surveys from the Institute for Local Self-Reliance found that businesses in communities with these campaigns have higher yearly sales increases than those without. What's more, research firm Civic Economics found that 48% of revenue at independent stores recirculates locally, compared to just 13.6% of revenue from chain retailers. Even Bacon, who has lived in New York City for years, sees shopping local as vital to individual communities. "It's something that has always been important to me," he said. "Being able to go and know the people, and know the store, and have a personal connection to the store and the people who work there." For local businesses used to juggling dozens of donation requests around the holidays, Shift Your Shopping for Good streamlines the process. In participating stores, customers designate where they want their donation to go (10% to 20%, depending on the store), while online shoppers get an automatic email. The small business cuts one check to Causetown, which distributes donations to the individual nonprofits -- making it clear which retailer brought them those dollars. One caveat: Customers must say that they want a portion of their sale donated; it's not automatic for all purchases. That means local nonprofits and participating shops are actively promoting it. In cities like Washington, D.C., Shift Your Shopping for Good is part of a massive buy-local campaign, so people are hearing about it in shops, email blasts from nonprofits, on social media -- even on coasters at the local bar. Causetown's Dan McCabe hopes the campaign will be a frame shift. Building a connection -- between causes and retailers; between shoppers who care about charities and the retailers that support them -- is the basis of Shift Your Shopping for Good. If something as innocuous as the Kevin Bacon game could go viral, why not this?